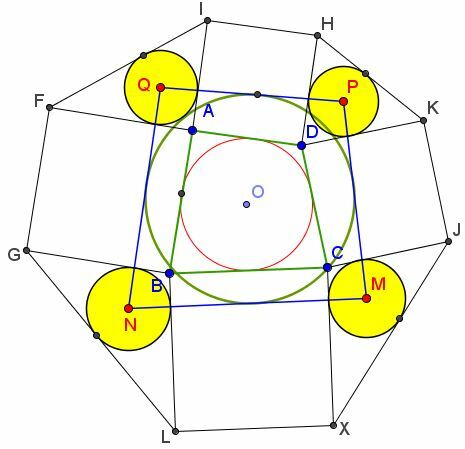 Given inscriptible quadrilateral $ABCD,$ construct four squares $AFGB,$ $BLXC,$ $CJKD,$ $DHIA$ (all either outer or inner, relative to the quadrilateral). Let $N,$ $M,$ $P,$ $Q$ be the incenters of triangles $BGL,$ $XCJ,$ $KDH,$ $IAF,$ respectively. Then $MNPQ$ is an inscriptible quadrilateral. The problem has been posted by Dao Thanh Oai (Vietnam) at the CutTheKnotMath facebook page.